Walking out of the metro in Monastiraki you immediately see the stunning Acropolis of Athens and get swept up into the busy vibe of the city. Monastiraki is a suburb busy with bars and restaurants and has a bit of a music vibe. It's a great place to stay as there is a lot to see and do around the area. Filled with a range of different places to eat, drink and socialise. I stayed at the City Circus Hostel on Sarri St (it was a fantastic hostel - I will write a separate post on where I stayed throughout my trip). I wanted to see Athens as it was one of the places I always wanted to go. I wanted to see the Acropolis and the Panathenaic Stadium. Those sites lived up to what I had always imagined, especially going early in the morning (8:45am) when there were no tourists (I would strongly suggest this - thanks Alice). Wow! The Acropolis of Athens is an ancient citadel on top of an extremely rocky outcrop of the city (thanks Wikipedia). Thanks to the Rick Steves audio guide of The Acropolis of Athens which gave me all the history about it that I never learned before. (and to Alice for recommending it). It was amazing to walk around an area so ancient. To overlook a city so old and so worn. Athens has been through its fair share of turmoil and yet it still stands. You can see its age as you stand on the Acropolis and look out over the city. You can also see so much of ancient history built around the centre, the Acropolis. The Parthenon was a sight to see (also the featured image). Even though it was destroyed by a freak explosion and then damaged over time by acid rain and the harshness of time, it was still an amazing structure. You can see in places where the Greek Ministry of Culture has commenced selected restoration where there is new white marble precisely cut to match the gaps of the ancient marble. A structure that was completed in 438 BC - yet still stands and is still considered one of the the greatest monumental structures in history. I stood there staring at it while Rick Steves took me through the history for about 30 minutes. In awe of finally standing in front of such a magnificent structure. The Erechtheion was another amazing structure and temple on the Acropolis dedicated to both Athena and Poseidon. A huge temple filled with detailed architecture and design and was about four storeys high! The entrance way, the Propolyea was HUGE!! You don't see entrance ways like that anymore, but I guess it needed to be to match the greatness of what you were entering to see. At the other end of the Acropolis is a viewpoint across the other side Athens which by all accounts just as amazing! Pynx Hill is one of the three hills surrounding the Acropolis, forest like, beautiful, filled with numerous running trails and what historians believed to be Socrates' Prison. I loved walking through greenery. Athens city isn't filled with much greenery. It's filled with a lot of people, traffic and dirt, in particular Monastiraki, so it was nice to come to a place that felt closer to nature. Closer to natural beauty. On top of the hill you have a 360 degree of Athens and a good view of the Acropolis, as that is the centre of everything. The Panathenaic Stadium the home of the first modern Olympics. I got there relatively early before all of the crowds turned up and it meant that I was able to appreciate the importance that it held for Greece when the modern Olympics began. A beautiful stadium that's now not actively used. The Annual Greece Marathon ends there and schools are able to use it for their athletics days, but other than that, it's not used. Standing where greatness stood was extraordinary and humbling. You get a free audio guide with your ticket (5€) and it was very informative! There is also a small room of memorabilia of every official Olympics poster and a range of Olympic torches as you walk up the cave of greats. Athens free walking tour was great! 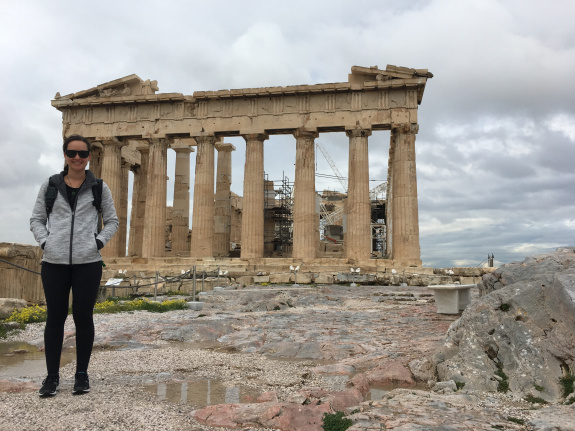 The tour meets at the Arch of Hadrian and walks around the iconic parts of Athens (in rain, hail, thunder storms or sunshine). Our tour guide Sam (originally from South Africa who came to Athens over 26 years ago on a two week holiday, fell in love and never left!) was fantastic. She shared history as well as laughs and taught us why horse statues are always designed in a certain way (one foot down, two feet down, both feet raised, tail down, tail raised - look it up!) I would highly recommend this tour. The tour runs every day and leaves at 9:45am. You can also request alternative language options, Marianna and Julieta got a Spanish guide. I would also suggest tipping at the end, I tipped 10€. 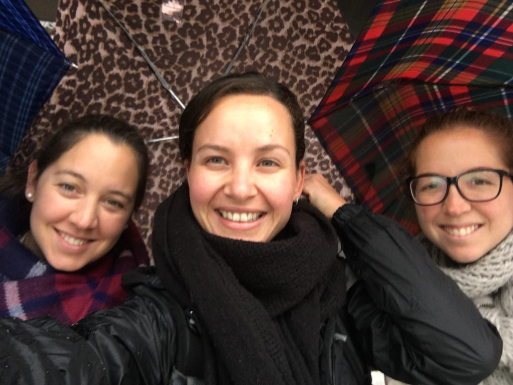 Marianna, Julieta and myself in the pouring rain before the tour started. Walking through the National Garden through giant rivers of rain. The Bar crawl that starts at City Circus hostel. For 10€ it includes going to four bars (one nightclub) in Gazi where nightlife lives. It was good fun! The crawl is led by Jacky, originally from Germany has been in Athens 3 years and can see herself living here forever. Veronica, Emilie (twins from Newcastle, Australia), Julieta (my hostel roomie from Argentina) and myself all went. We went to a rooftop bar where you could see most of Athens and see the Acropolis lit up (so pretty!). We stayed out until after 2am and got lost walking back to our hostel, but not once did we feel unsafe. Even if you're not staying at City Circus you can still join the bar crawl, I met some cool people! 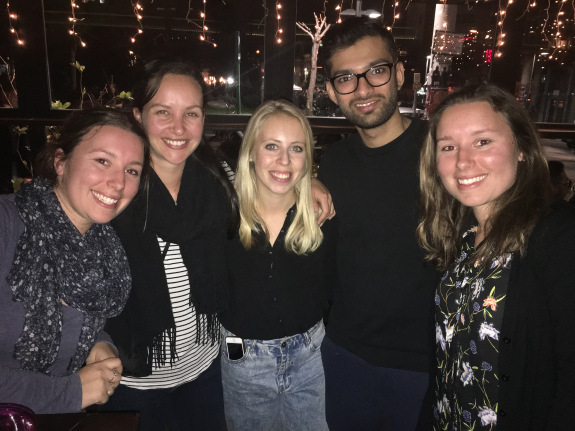 Including Nishant, a Sustainability Consultant at a bank who lives in Amsterdam after moving from India two years ago. Excursion to Askliplio Voulas a town on the south coast. Veronica and Emilie were going to this little town so I decided to join. We took tram #5 1h20m out Athens and were thrilled to see beach and ocean. The sun was coming out, it was a perfect day to stroll and enjoy being away from the busyness of Athens. To be fair, there wasn't a hell of a lot happening in the little town, but it was still a nice little getaway to enjoy some sun and the smell of the sea and for 1.40€ each way, why not! I didn't see the National Archeological Museum, even though it is highly recommended, I chose the day trip to Askliplio Voulas instead with my new found friends (YAY for hostels). I am not that into archeology, so I chose something that I would enjoy more and I did! Do what you want to do. You don't have to follow the masses. Walking through Athens city on my own and again with the walking tour you notice the age of the city. You notice that Greece's economy is struggling as the upkeep of the city has stalled. We had a day of torrential rain with thunder & lightening (the day of our walking tour and it was still on!!) and the street edges turned into rivers as the drains couldn't handle the amount of water. Stray dogs and cats are in high numbers around the city and it makes me so sad. Even though most are fed and adopted by the city, they are still lonely and without warm homes. Despite the country's circumstances, the Greeks are filled with so much love and hospitality. Oh there food - amaze! Not once did I feel unsafe or unwelcome there. Passing people in the streets there were always smiles. Even walking through the flea market, you weren't haggled to death by shop owners trying to make a sale. I covered most of the Monastiraki, Plaka, Acropolis, Stadio and National Garden areas, I got lost, I ate street food and it was all amazing! Athens is an old, strong and great city. If you want to explore history and come to where democracy started, then this is your place! I spent three days and four nights there and that was just right for me! At the restaurant 'Family' we went to on the coast, they had this printed on their place mats and I have to say, it sums up the love that Greeks have for those around them pretty well.